Give snack time some healthy zest with these apple ring cookies! Slice apple into thin rings and remove core from each ring. Spread nut butter on one side of ring. Top with almonds, walnuts, raisins and coconut. Feel free to substitute chocolate chips for the raisins and/or chocolate-hazelnut spread for the nut butter. ‘Tis the season to enjoy a good-for-you fall fruit that the whole family loves – apples! Apples are child-friendly, healthy snacks. They are fat, sodium and cholesterol free! Apples are grown in all 50 states and orchards across the country offer apple picking, hay rides and hot apple cider at this time of year – a day of family fun and good memories. Apples can be more than just good to eat. Check out the fun ‘apple’ activity below. 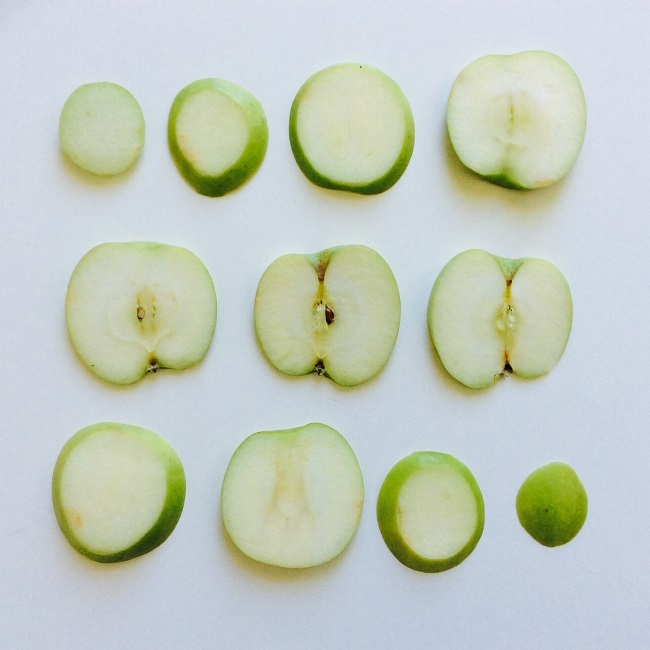 You can use apples as stamps to create fun pictures, wrapping paper or to decorate t-shirts and other wearables! 1. Cover your work surface with newspaper and make sure everyone is wearing old clothes or a smock! 2. Pour paint on the paper plates (one color per plate). 3. Cut the apples in half (adults only). Create an apple silhouette by cutting the apple from top to bottom, or create a circle with a “star” by cutting the apple horizontally. Ask your child to guess what the shape will look like before you cut the apple, or brainstorm various ways to create different shapes with the apple. 4. Encourage your child to dip the flat side of the apple in the paint (trying to thoroughly cover the flat surface) and then place the apple – paint side down -on the printing surface. 5. Enjoy creating fun designs and pictures with your homemade stamps!